Estrade Media Pte. Singapore, recently hosted the 3rd Estrade Real Estate Conclave & Awards 2017 – Singapore, which was scheduled on 6th October 2017 at the Grand Copthorne – Waterfront. The Estrade Real Estate Conclave and Awards is the only India focused, business to business connect engagement for the Real Estate industry organized in South East Asia. The awards night brings together more than 100 business leaders comprising of Real Estate developers, Interior Designers and Architects. Unlike other industry engagements organized in India, where the connect is more local, Estrade Real Estate Conclave provides a global connect at an international platform. EarthenHive Architects’ Sudhakar Grande’s Villa won the Most Sustainable Architecture Design – Residential. 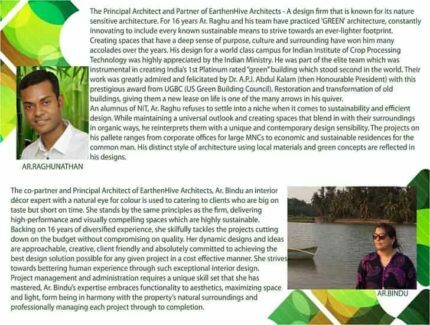 Team Estrade had the opportunity to speak to Architects Raghunathan Elangovan and Bindu K– Founders, EarthenHive Architects at the 3rd Estrade Conclave and Awards 2017 in Singapore. Following are the excerpts of this interview. Our design philosophy is well described by our brand ‘EarthenHive’ where the term “Earthen” reverberates our love and care for the Ecology and the word “Hive” resonates our creativity and hard work in the field of architecture, where time and concept needs to be at its perfection. Who is your inspiration? Which types of designs inspire you the most? Our inspiration derives from various elements of nature where each and every creation displays revelations of architecture. Beehive is one such nature’s inspiring creation where design, quality and time are at perfection and the celebration of utmost efforts results in the form of honey. We are always fascinated by efficient green building design with vernacular and sustainable concepts while maintaining the universal outlook interpreting few contemporary design sensibilities. How have the new technologies affected an Architect’s thinking process? “Architecture is a visual art, and the buildings speak for themselves” Most Architects traditionally managed to achieve the same through in-depth imagination and the conceived creative ideas were sketched in the form of various details to conceptualise and transform them in to reality. But, new technologies seems to deter such practices through certain modelling tools shortening the thinking process leading to limited scope for fine detailing. But there are also commendable advantages of new technologies which supports the architects to render the service effortlessly. How do you incorporate environmental and social sustainability in your buildings? What role does the idea of green buildings play into your work? It’s always been EarthenHive Architects chef d’oeuvre when it comes to sustainable/eco-friendly architecture. All our Iconic projects resonates harmonic blend of design and space, gamut usage of sustainable elements, Maximum natural lighting and ventilation, optimizing on the natural resources by alternative renewable/recyclable solutions. Such is our architecture which is a visual art, and our creations speak for themselves raising the bar for quality of innovation, optimization and functionality. Can you tell us about any projects you are currently working on that you are especially excited about? As mentioned earlier our passion lies in vernacular and sustainable architecture hence it would be appropriate to talk about one such eco theamed resort project called Coorg Heofon – “An Eco-Resort”. Kodagu/Coorg district or “Land of Cauvery” is situated in South-western Karnataka. Emerald green till the eye can see Coorg is known as the “Scotland of India”. The verdant landscape is dotted with rolling hills, valleys, paddy fields and acres of plantations intertwined with teak and sandalwood sholas. “Coorg Heofon- An eco-resort” is set in such 14 acres of pristine surrounding to accommodate 25 finely crafted eco-cottages of various categories with all the luxurious amenities. The design-concept is an astute amalgam of zoning and planning with built masses blending with its natural environment. The design highlights the natural features of the undulated hilly site and works with them, making it an asset rather than a hindrance. Meticulous zoning in the master plan is to fall zero trees. Staggered planning along the contoured terrain to avert the loss of precious top soil and prevent soil erosion. The naturally existing runnel collects to form a characteristic pool, which doubles as a swimming pool. All buildings with classical Coorg architecture have natural cross-ventilation and stack effect through central courtyards. Also the use of clay elements in the interiors to maintain comfortable ambient temperature. Vertical expansion through duplex structures to reduce the foot prints of the buildings, also to preserve the natural vegetation at its best. The utilization of renewable energy in active areas to reduce the carbon cost of the place to a great extent. What needs to be adopted in policy terms for architects and interior designers to come up with more innovation in their work? The earth is what we all have in common and as architects it is our responsibility to protect it through nature sensitive designs while planning any space. There should be clear policy terms for environmental friendly designs encouraging architects and interior designers to take greener path of designs. What is your ultimate goal when it comes to your work? What do you want to be remembered for? What advice would you give to young designers starting out today? The young designers are the creators of the future in the era of globalization… Their advantage is that they posses talents in sync with the latest technologies. They should use this as a boon to constantly innovate in their designs which is not only aesthetically creative but also sustainably efficient. They need to focus more on bioclimatic and topographic data in their design process through various design modelling tools which will add value to the sustainable practices. How IT & IT solutions enhance value in design of living spaces? In this modern world, IT & IT solutions have become integral part of design of any smart living space. From the initial design stage to transforming them in to reality, IT solutions supports in various aspects like analytic tools, design/modelling, realistic rendering, automation, security etc. These solutions not only saves time but also helps in understanding the quality of design in terms of appearance, functionality, durability, comfort and safety. AI and 3-D printers are posing a challenge to traditional jobs in most industries. Do you also face a threat from these new technologies? Since time immemorial man has been creative architect, always creating spaces with the sense of culture, purpose and the surrounding with the locally available resources. 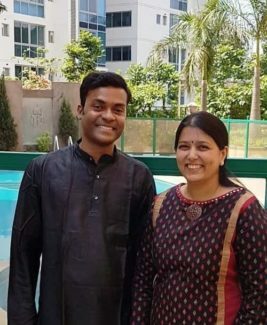 This passion manifested in varied forms like the spiritually enriched Indian Architecture-Dravidian, indo-Islamic to the progressive vernacular architecture, also the prestigious Roman era, Dutch, Mediterranean, colonial etc have their distinct style of design creativity. In this regards new technologies in the field of Architecture and Interiors, can only support us in the form of software tools or equipment to help us easily transform the creative ideas in to reality so the threat part is comparatively negligible.